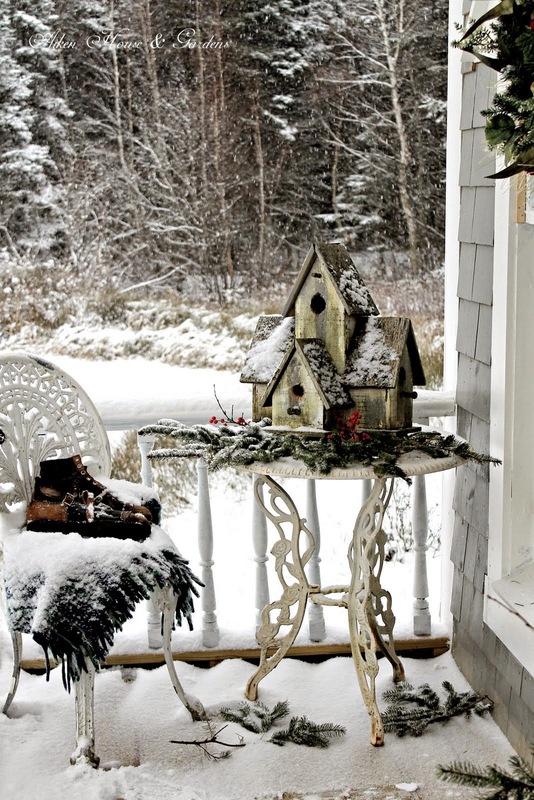 A porch vignette to start off with. the past I wanted to share a quick overview today. she is our grandchildren's new puppy. a comfy bed to curl up in. has a cozy English look. A tea time all ready for a visitor. look of the rest of the boathouse. I love mixing in some tartans. A tea time for you before you leave. and link party at Creative Country Mom. season showing between Nov.28 and Dec.12. a fundraiser ~ by donation only. 128 Mac Rae Dr. East Royalty. 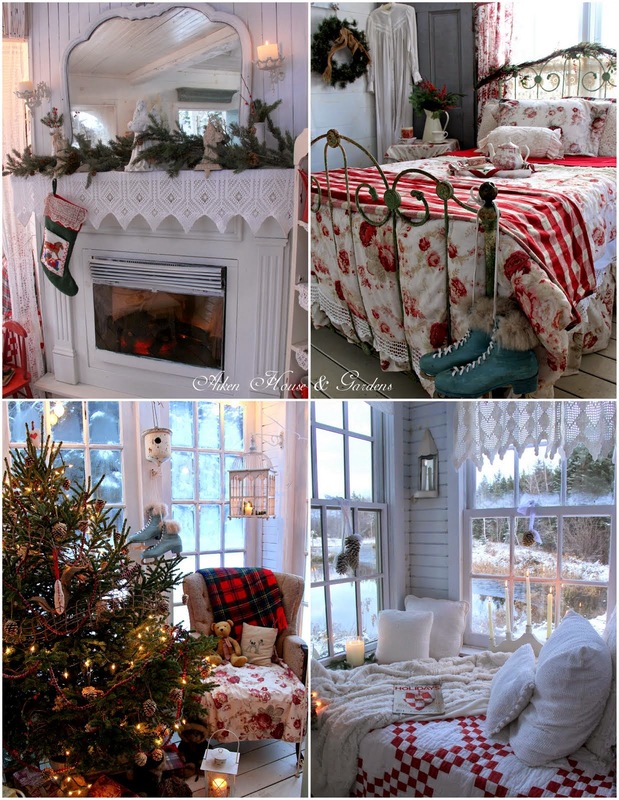 A review of your gorgeous spaces all decked in its holiday splendor is a real treat, Carolyn! Going to be watching for those holiday tours. Sure gets me in the spirit to get my decorating done. I have our house in a real messy uproar right now, one step at a time, yes? Carolyn I so enjoyed my tour of the Boathouse this morning, such a delight. I could easily snuggle down in there for the winter. I just clicked on the news and was hit in the face with a feeling of yuckiness. Clicked off that real quick and came here instead. Ahhh! Bliss! Carolyn, I could see your images again and again and always want to come back for more. Your boathouse is so charming. I'd love to snuggle in by that pretty tree or spend the night in one of your comfy beds. That loft is beyond adorable! Would you adopt me? Lol!! Thanks for beautiful photos as always. Your world there is so charming. Everything is just so lovely to look at. What great holiday inspiration. Do you know the company of the beautiful floral spread you're featuring? Your boathouse looks beautiful Carolyn! Hope you and your family had a lovely Thanksgiving. Just beautiful, Carolyn! Such a lovely place to spend some time. Love red and white for the holidays! Your guesthouse is beautiful. Aaahh, so beautiful! Love your pictures and your décor in your boathouse. Maybe I've missed it in the past, but how do you use your boathouse? Is it for guests, do you stay there or is it just a lovely "play house" for you to pretty up for your garden tours? You've done such a marvelous job with this fantastic space! I'd love to curl up with one of your cups of tea and a book there! We had our first snowfall last night! The house is wearing eyebrows now! Lol Heading out to the Farmers' Market this morning to see all the wonderfulChristmas goodies. Have a great day, Carolyn! OMG What a divine cottage I could just curl up in there and never leave! What a cozy and lovely space. 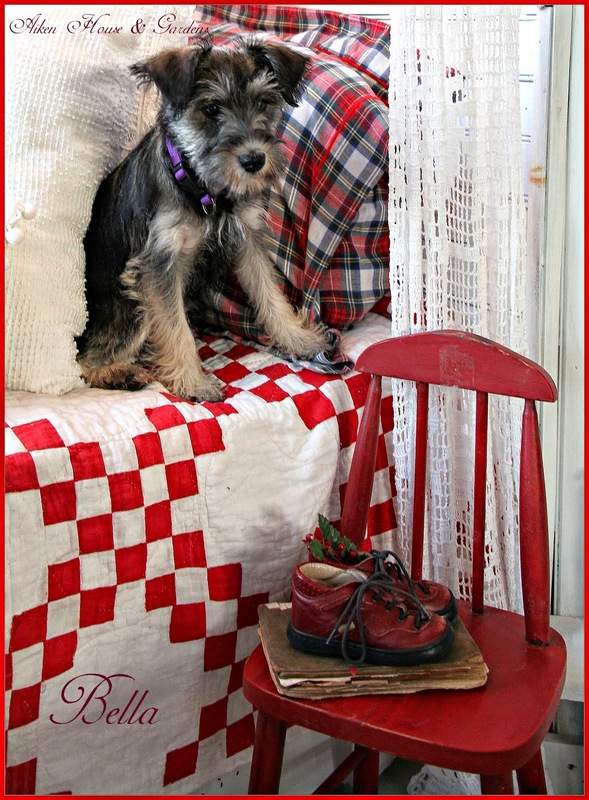 I really like the reds and whites and pops of vintage charm. Can I come and stay? I am following from the tour and I am a little late, but I have enjoyed visiting your lovely blog. I want to live in your boathouse and every room in your home. LOL, its better than chocolate. Sharing and pinning. Have a lovely week and I am a new follower. 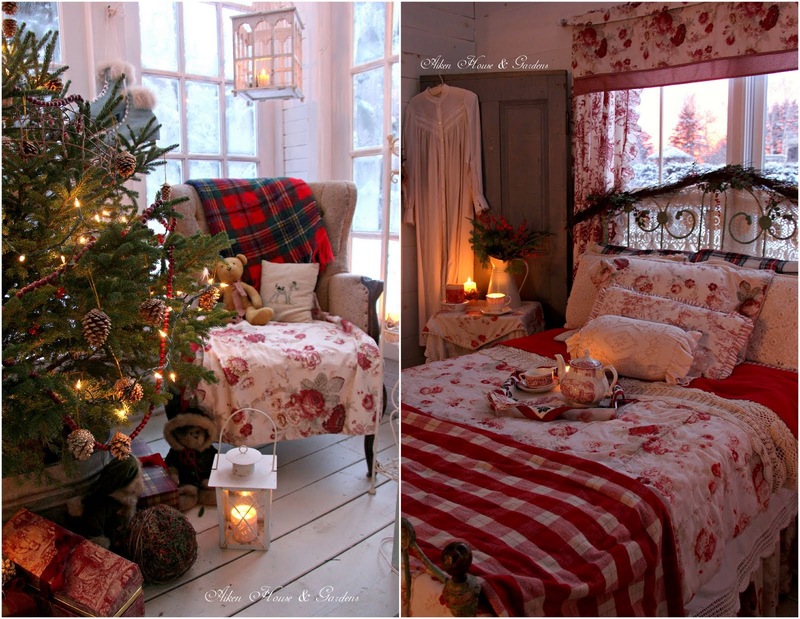 What a beautiful cozy room! 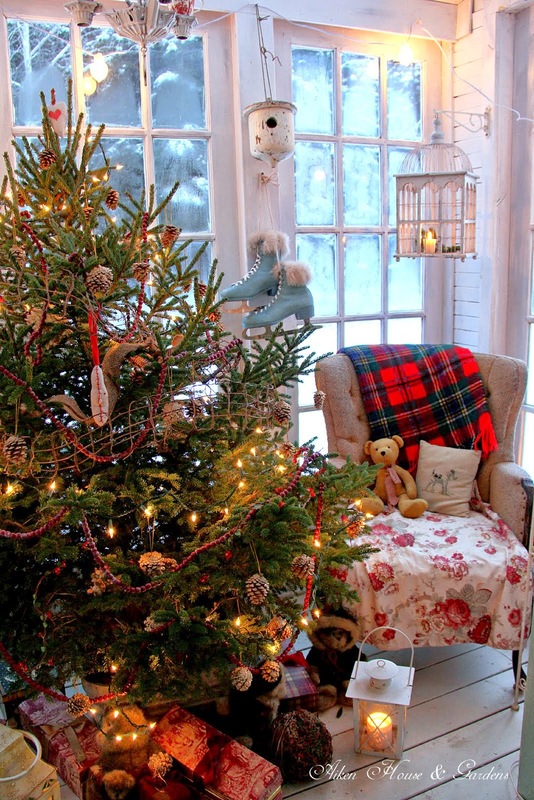 I could sit in that lovely room forever!You did a beautiful job decorating,it looks like it's right out of the pages from Romantic Homes magazine!Merry Christmas! Simply perfect and I could look at these images all day. Love all that red! Oh my gosh I LOVE it all! Can I just come stay with you for week! That is what I have pictured as the ultimate Christmas winter. Oh my gosh I LOVE it all! Can I just come stay with you for a week! This is totally what I have pictured in my head as the ultimate Christmas winter. such a cozy space!!!! 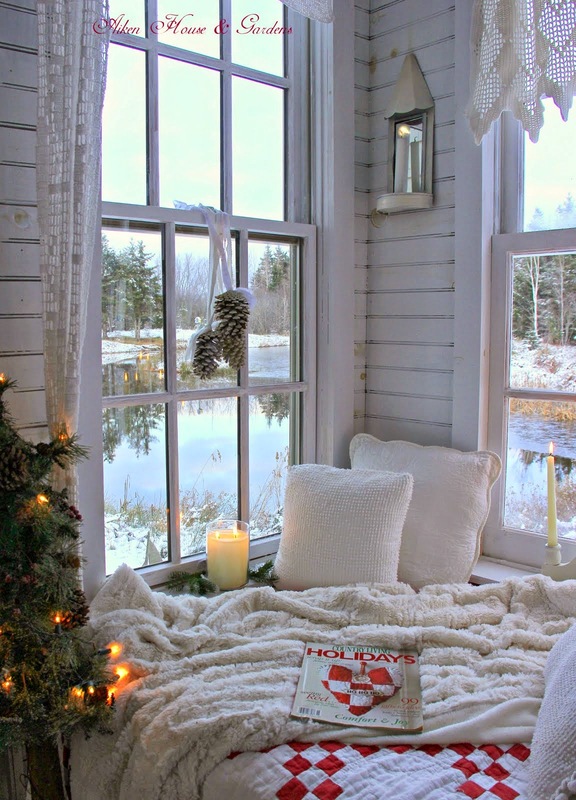 i love it- would love to nap or read in that bed while snow falls. hopping over from kirb appeal. Just gorgeous! Thank you for sharing such beauty! Cheers. I just discovered your beautiful blog today. Thank you for all the lovely inspiration! Merry Christmas from the opposite end of the country!